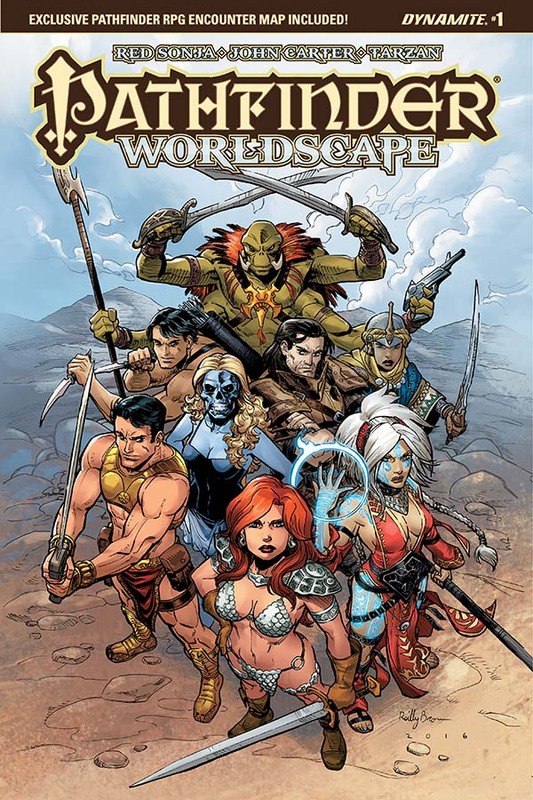 The Fellowship was fortunate enough to obtain a copy of PATHFINDER: WORLDSCAPE #1 from Dynamite Entertainment. Erik Mona writes, Jonathan Lau draws, Omi Remalante colors, and Simon Bowland letters. One minute the Pathfinder team is fighting a monster underneath the city, and the next they find themselves waking up, separated and on another world. Valeros wakes up surrounded, and fights his way out of that into another fight, which eventually lands him in the arena of the Empress Camilla. The Empress holds a tournament to choose her champion, and Valeros is battling Red Sonja when he discovers something strange. There’s a lot going on here, and Valeros (on whom the issue is focused) is missing much of it. But he’s not really the thinker of his party of adventurers, so once you realize that, things start falling into place. The combat scenes (which take up most of the issue) are beautifully drawn, and there are enough hints of other worlds and other characters (the white apes of Barsoom, for example) to make me want to read more. I’m not usually all that hot on crossovers, but there have really been a string of fascinating ones lately. The worlds that this one touches on have enough in common that I think this will prove to be a good one. PATHFINDER: WORLDSCAPE #1 is available now at your FLCS or at dynamite.com.